It is obvious that Silicon Valley CEOs who have banned Alex Jones are either unsure why they banned him or have banned him because they have bought into the lie that he is some kind of a right-wing fascist nazi. Alex Jones is a conspiracy theorist/entertainer who holds positions on both sides of the political spectrum. He is both pro-gun and anti-war. He hates American football as much as he hates Hollywood. I could make a list of all of Alex Jones left-leaning positions (he thinks drugs should be decriminalized for instance), which I probably will in another post but he has never been a “support our troops” conservative guy. In fact, over the past decade, he has warned the public about the Patriot Act from the beginning, even going so far as to warn his listeners that government troops would follow unconstitutional orders if Marshal law was enacted. Jones predicted the NSA spying grid (PRISM). Even Howard Stern was influenced by Alex Jones in the early 2000s. Howard Stern was apart of the early 911 truth movement. I heard Joe Rogan say on his podcast that it was so egregious for Alex Jones to question the events at Sandy Hook. Was it egregious for Stern to question the official 911 story? Should Stern have been blackballed and removed from the air like Jones was after September 11th, 2001. Alex Jones literally came on the air on September 11th, 2001 and made the same claim as Howard Stern in the video below and lost most of his affiliates. “Late last year, we received a business enquiry from Infowars. They were looking for a platform to build and run their own self-contained community for followers and fans of alt-right activist and Infowars founder Alex Jones. We turned them down. But the questions surrounding why we made that decision – not least whether we were right to do so – still loom large for us. That day, I was running through the long list of new prospects that had come in from our website. The usual assortment of communities had come to Disciple, all wanting to build their own online social platforms. Wellness gurus, politicians, an association for CMOs, an up-and-coming hip-hop artist, an exotic car owners club, a resort in Florida and… an alt-right firebrand banned from most of the internet, accused of fomenting fascism in the US and adored by Donald Trump’s most extreme followers. You see, one of the unanticipated aspects of my job as Disciple CEO is to be the arbiter of what we, as a company, view as acceptable communities for our platform. Essentially who can and can’t use our platform to build their community. And so far, I think I’ve probably got these decisions right. But rather than referring to an approved rubric when guarding the gates to our platform, it always feels like I’m basing the decision on my own values and the shared values of the company we’re building. He frames Alex Jones as if he were equal to Wack Packer/KKK Grand Dragon Daniel Carver. Vox.com published an article calling Jones a “leading purveyor of violent and sometimes racist (and anti-Semitic) conspiracy theories.” Alex Jones has Jewish children yet is racist and anti-Semitic? I don’t believe in either the Sandy hook conspiracy or the 911 conspiracy, yet I don’t think it makes someone a crazy right-wing fascist unhinged lunatic (insert pejorative) if they question the official events. 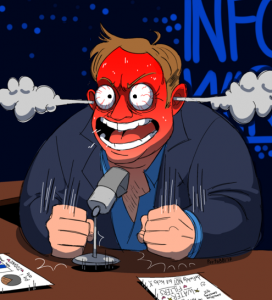 Its probably healthier for our society as a whole to have both Anderson Cooper reading off a script on CNN every night and Alex Jones questioning what’s coming out of his mouth. We have the freest media in the world for that very reason.